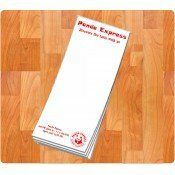 Get your custom magnetic notepads with the most inviting designs at CustomMagnetsDirect.com! Whatever your requests or concepts are, our designers will create them with precision at a low price! You can select a preset design or suggest your own custom design. We will make sure that your purchase is the best choice suitable for your needs. 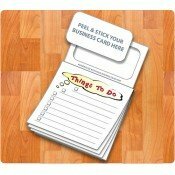 Some of our best-selling magnetic notepads are personalized magnetic notepads for kids, business card notepads and real estate magnetic notepads. 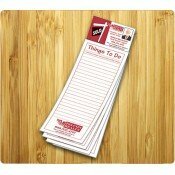 Win over your clients, prospects and whoever you meet by handing these custom magnetic notepads! You will not only enjoy more responses than before but also have improved brand recognition. 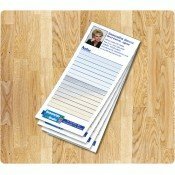 Notepad magnets are extremely affordable, practical and it is the easiest way to grab that clinched recognition that you have been yearning for. These magnetic notepads work as a magnificent expansion of a business card and it will remain fresh in the minds of customers for long time. Users can track down grocery lists, appointments or any other household or business related quick notes at one place over their refrigerator doors. 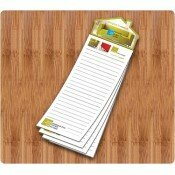 Offered in 20 and 25 sheets, these notepads are backed with magnets in 20, 25 and 30 MIL thicknesses. You can have them the way you want it. 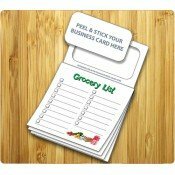 Our team of graphic designers will help you customize these notepad magnets with ease. You can avail of our free art setup, free online design proof and free shipping by ordering any of these personalized magnets. 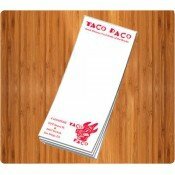 Wholesale magnetic notepads are offered at sinfully lower prices thereby making it affordable for even startup businesses. These custom magnets can be used all throughout the year. It can be given as a gift by marketers who are targeting homebodies, office goers, students, teachers and many others. It can be offered as a compliment, encouragement token or as a tradeshow giveaway. For clarifications on prices and requirements, approach us at 855-762-4638 or reach out to us at info@Cmagnets.com.